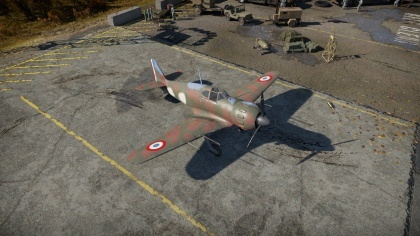 The M.B.152C1 is a gift rank II French fighter with a battle rating of 2.3 (AB/RB/SB). It was obtainable during the 2018 Festive Quest for five Christmas toys for pilots earned during the event. Designed by Bloch to be equal to the Luftwaffe Bf-109 "Emil" fighter, it performs this role in War Thunder as well, being able to compete with the Emil's on a more than even footing. The Bloch M.B.152C1 is a "jack of all, master of none" type of plane. However, unlike other planes in this category, the M.B.152 will perform admirably in most combat situations it's thrown in. Wielding a pair of the powerful Hispano 404's, complemented by a pair of MAC 1934 7.5 mm's, it can shred fighters and attackers in a few well-aimed shots. When flying the Bloch, you can put it into most fighting styles and it will perform fairly well in all of them, with the exception of Boom-&-Zoom due to its mediocre speed, especially when compared to contemporaries like the early Emil Bf 109's. It is, however, suited to energy dogfighting due to its above-average energy retention, good turn rate and acceptable climb rate, so it is recommended to use it in this style. 830 310 ??? ~?? ~? The 152 has the unique feature of being equipped with 10 mm steel plates in front of and behind the pilot, something that is not common for 2.3 fighters. However, this armour doesn't help much versus cannon-armed fighters, as it seems to be particularly vulnerable to 20 mm shells. As stated before, the Bloch can fit into any combat style the pilot can put it in, with the exception of Boom-&-Zoom, and even in that role, it is decent. The main tactic one should use is energy dogfighting, a mix of energy fighting and dogfighting. Attempt to gain altitude, preferably 4,000 meters, then search for a low flying target. Once you find your prey, examine their energy state and potential energy, determine whether the plane they are flying is superior to yours, then you can choose if you can engage or not. During an engagement, do not let the opponent lock you into rolling manoeuvres, such as the rolling scissors, as the Bloch's roll-rate is mediocre at best. BF 109's.' Although the Bloch was designed to be equal to the Emil's of the time, the legendary Messerschmitts can give you a run for your money. You will mostly encounter the E-1's through E-4's, and they will be able to out-speed you by a large margin. However, you can turn better than them, although be sure to make effective use of the rudders. nder no circumstance, allow a cannon-armed Emil get a clean shot on you. This will almost certainly critically damage you, if not down the plane. Early Spitfires. While the 152 never had to fight Spitfires in real life, War Thunder poses this threat. The famed British fighters outclass you in every way, shape and form. Do not engage with a Spitfire unless it is critically damaged or you are sure to down them. Yak's. The Yak-1 is one of your most formidable adversaries. It out-speeds, out-turns and out-climbs you by a large margin, while also sporting powerful armament. However, all Russian fighters lose significant performance above 2-3k meters and have a very weak airframe. Attempt to engage one at around 4,000 meters and employ an energy fighting combat style with an emphasis on speed. 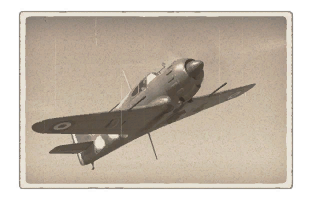 The M.B.152C1 is a premium plane, and as such, has all modules unlocked by default. In terms of belts, the 7.5 mm tracer belt is made up entirely of incendiary rounds, but have low penetration values, so universal is a decent choice due to the inclusion of AP rounds. The recommended cannon belts are either stealth if you are confident in your aim, or universal if you are just learning the trajectory of the Hispano's. A French fighter from the initial period of war. During the Battle of France, pilots in MB.152s won no less than 180 victories in the air. This rank II fighter controls very nicely and can reach a maximum speed near 500 km/h. It is equipped with a pair of 20mm Hispano-Suiza cannons and two French 7.5mm MAC machine guns. The MB.152C-1 is a single-engine monoplane fighter that went into production in 1938. Its designers prioritized the aircraft’s flight characteristics – its air-cooled radial engine put out 1,080 horsepower (quite respectable for the time) and was generally on equal footing with the early “Emiles,” Bf 109 fighters from the “E” series. The armament was also extremely modern, and the familiar rifle-calibre machine guns were backed up by 20mm cannons.